Friends, while at SNAP! 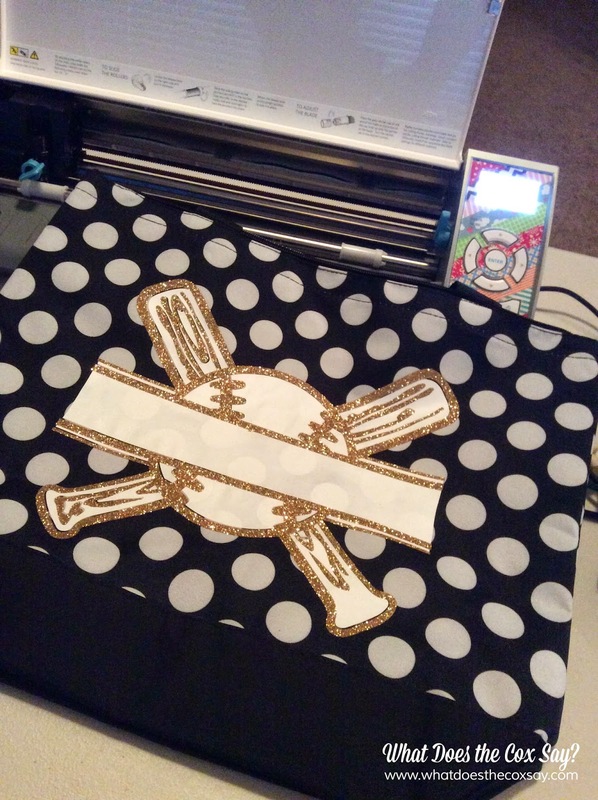 I scored some awesome Heat Transfer Vinyl from Expressions Vinyl. I was hoarding it trying to figure out the perfect craft for it and then it came to me. My little man has started his very first year of T-Ball this year and I am so excited for him. I decided to try something I hadn't tried before and layer the Vinyl. 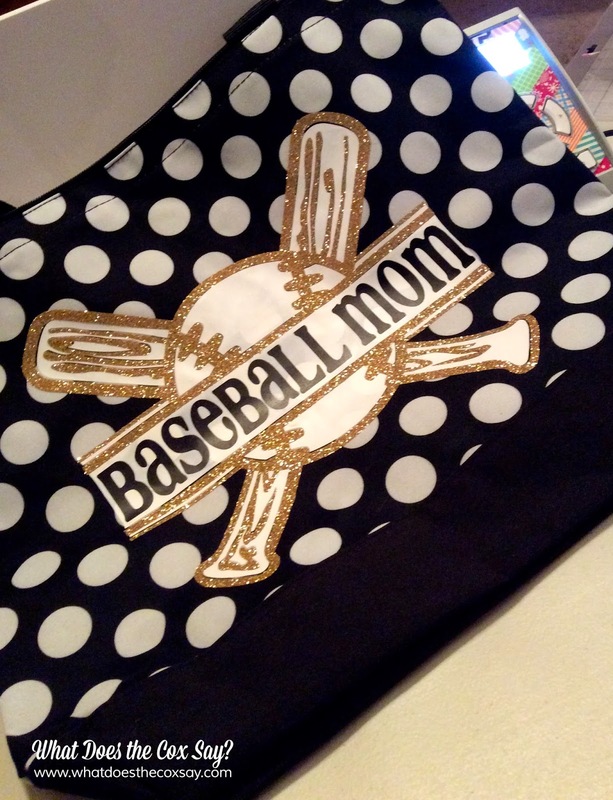 I really wanted my Baseball Mom logo to pop. I used black, white, and glitter gold vinyl and I loved the way it turned out. The most important tip I have for you is to be aware that the more you iron over the vinyl as you layer, the more transparent the white will become. Also, do NOT iron directly over the vinyl. I did that on accident and I melted the vinyl. Good thing it was only a small part of it, otherwise I'd be so bummed that I ruined the bag. I love that with vinyl, especially the black and white, it was SO easy to weed. I kept telling my husband that it was smooth as butter! Another thing that I loved was that the vinyl has a clear transfer over it to protect the vinyl from melting so it is easy to see where you are placing it on your project. So with layering the vinyl, I could see exactly where I was placing everything. 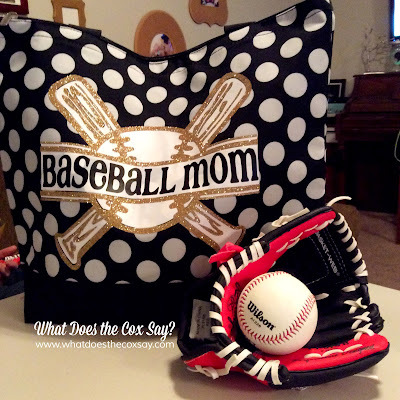 I shared in my personalized tote in a SNAP! post how to work with the iron on vinyl. I also think a key thing is knowing what setting to cut your vinyl with. Here's a great post to show you what you should have your machine set to if you are using a silhouette or a cricut. I was so happy with the finished project. It's perfect to show my pride at being a Baseball Mom and also holding all of his stuff. It was such a fun, easy project. I think what took the most time was figuring out which colors I wanted to stand out and then how to weed out the pieces of vinyl. It really was one of those projects you could do while watching an episode of you favorite show and then be done! I am obsessed with this vinyl! It has been hands down the easiest I have EVER worked with. I will be buying more soon! I know I might sound like an ad, but seriously, this post isn't compensated, I got the vinyl from SNAP and I had to share how stinking awesome it is. And I love that I get to represent as a Baseball Mom now in such a fun way. Quick, easy, projects are my specialty, so be sure to follow along for more! I LOVE THIS!!! So, so cute!! With the convenience of the internet,freebet no deposit sportsbook putting your bets in sports outcome can also be done online these days but of course..